It's finished! 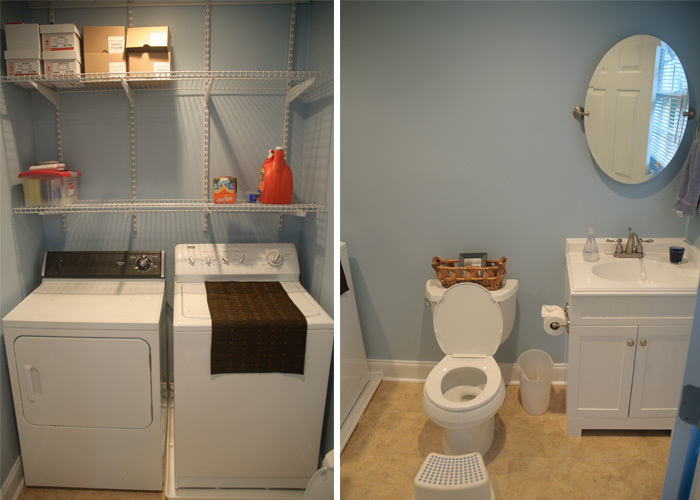 The guys wrapped up the new laundry room on Saturday morning. It is better than I thought it would be. Judd calls it the Taj Ma-Laundry. Compared to where I was doing laundry, that's about right. The guys that we hired to do the job were fabulous. They were on time, polite, and really nice. But best of all - they finished when they said they would! If you need the name of a contractor - let me know - I'd love to pass his name and number to you. This remodeling stuff is addictive! Now that this is finished, I can't wait to get started with the next project. I just wish our budget felt the same way! Talk about an improvement! That looks awesome. Does it make you want to do some wash or what?! Looks great! I'd love the name of the contractor. We still want to add a 2nd sink in the boys bathroom at some point. has that changed your life having the laundry rm so close now!?! so fun!